Introducing ATOM, a unique new virtual instrument for Kontakt with a powerful custom engine fully equipped to spark your creativity. The machine is built around a beautifully diverse collection of intricate textures and organic elements, that were created from a huge collection of field recordings, custom made acoustic instruments including a tuned anker, propellers, the famous Koka’s experimental Box even a WWII Torpedo and analogue machine noises, which were then painstakingly recorded, edited using the most advanced sound design techniques and finally assembled into a stunning collection of abstract cinematic & experimental organic elements. with over 180 patches & presets to be mixed and matched as desired. A unique sound design tool to create a huge range of distinctive cinematic sounds, otherworldly atmospheres, mesmeric drones, emorive synths, noisey pads, organic keys, impressive cinematic fx, transitional elements, Impacts and and Melodic Motifs each with its own character and concept behind the creation handcrafted with passion, innovation and technology. This virtual instrument plugin comes with 3.000+ samples, a highly versatile collection of on board effects, an incredibly intuitive multi-layer engine with separate effects and arpeggiator engine for each layer to provide hundreds of sonic combinations. Atom has two layers of sound sources. The same 180+ sources are available on both layers and you can mix and match as you need to. 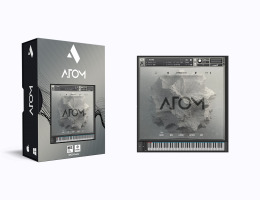 Atom features a custom convolution reverb impulse engine, full synthesiser LFO’s, filters, envelopes and a powerful dual arpeggiator engine for those looking to take their sound further than the preset patches. Atom is preloaded with over 180 exquisitely crafted presets divided into five main categories ATMO, KEYS, FX, PERCUSSIVE & SYNTHETIC. Each sound can be shaped into lush evolving pads, dense uplifting chords, strange acoustic tones, deep Textures, ambient soundscapes, layered ambiences, Imacts, transitional cinematic FX and elements for adding drama and movement into your compositions with all advanced features that allow unlimited flexibility over morphing, manipulating and processing.